The new 2013 Ford E-150 Cargo Van comes standard with solar-tinted glass, a feature any Phoenix driver will appreciate. The tilt and telescoping steering wheel is a necessity for safe and comfortable vehicle operation, especially when many different people take a turn in the driver's seat. Now, let's talk about power: The 2013 E-150's 4.6-liter Triton V8 engine can handle hauling your heavy parts, tools and equipment with ease. If the standard 3,250-pound payload capacity isn't sufficient for your industrial equipment, the E-150 can tow another 7,500 pounds. The E-150's "bigger brothers," the E-250 and E-350, are here to help if even more power is required. Optional features include a factory-integrated trailer brake controller to synchronize the vehicle and trailer brakes for seamless operation while towing. The E-series rear view camera offers obvious safety advantages and includes guides to facilitate trailer hitching. 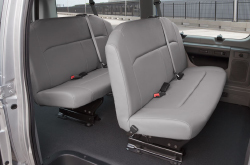 The myriad features available in the 2013 Ford E-150 make it a smart choice for all types of Phoenix business operations. Peruse the features and specifications below, and in our Peoria Ford virtual showroom, to see why Ford E-Series is the best choice for your Phoenix service fleet. When comparing the 2013 Ford E-150 alongside the 2013 Mercedes Benz Sprinter, Chevrolet Express, GMC Savana and the Nissan NV, and you'll spot that the E-150 ranks above those autos in several aspects. See just a few of the reasons below. Peoria Ford auto repair service in Phoenix is only a click away! Your Ford deserves to be treated correctly - that means Ford factory- trained technicians, legitimate 2013 Ford E-150 parts, and the joy that comes from a 12-month service work warranty. Peoria Ford's auto repair veterans will make your E-150 run strong, so get it to our Ford car maintenance division in Phoenix today. Our techs can tackle a slew of jobs - from hard stuff like Ford shock and strut repair to less trying projects like windshield wiper and brake pad replacement. Also, Peoria Ford offers hassle-free customer service and modest prices. Find out how much you can save on your next service! Just follow the link below. Now that you've had a chance to review many of the features offered in 2013 Ford E-Series Vans and Wagons, you can see why E-Series has been a top-seller in the United States for 33 years. A quick trip to Peoria Ford will have you even more impressed when you step inside an E-150. It's easy to visualize your own equipment neatly stowed in easy access bins; the optional added bench seat to accommodate a five-man work crew; the ladder rack package up top; all the features you could possibly need to service your Phoenix area customers. 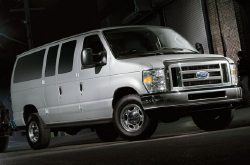 Whether your focus is providing residential or commercial field service, delivering product or shuttling passengers, the 2013 Ford E-Series offer the flexibility to be your overall business transportation solution. Our sales staff at Peoria Ford will help you determine the best option configurations to meet your needs, while our credit department is ready to assist with commercial financing. Give us a call or come by Peoria Ford for a closer look at the 2013 Ford E-150.